The Druid's Herbal: Module 2 – Option 2 California ~ Identify & research 3 poisonous plants in ones area and document your findings. 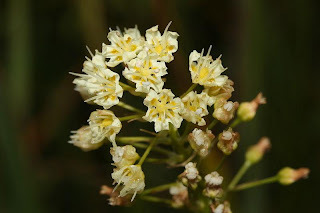 California ~ Identify & research 3 poisonous plants in ones area and document your findings. Methods of Poisoning: Ingestion, also can soak into skin. All parts are poisonous. Symptoms of Poisoning: Respiratory depression which can lead to death, seizures, fevers, panic, lost of vision. Treatment: Forced vomiting, the use of activated charcoal is used to absorb the poison from the stomach and gastrointestinal tract. Doses of physostigmine are intravenous administered if any signs of anticholinergic symptoms and agitation occur. Notes: The Chumash here call it Momoy and they use it religiously in puberty rites as a hallucinogenic. 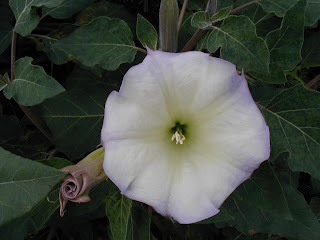 Is similar to Datura stramonium (Jimsonweed) which is why it is called Western Jimsonweed. Methods of Poisoning: Ingestion, All parts are poisonous. Symptoms of Poisoning: . The known symptoms are, vomiting, slow breathing and heart, unconsciousness, hyperactive tendons and limbs, hypotension, dilated pupils. Treatment: The usual, the use of activated charcoal used to absorb the poison from the stomach and gastrointestinal tract, saline carthartic (induced bowel movement), and forced vomiting (emesis). Notes: Poisonous in high doses, though Chumash have been known to eat it's fruit with no ill effect. I have been unable to find out why this is so. Symptoms of Poisoning: Was unable to find anything concrete on this plant. Finally asked a herbalist friend and she said it was safe to say since it is looks like a pretty classic nightshade, she would expect it to cause the normal atropine side effects (Blurred vision; constipation; decreased sweating; difficulty sleeping; dizziness; drowsiness; dry mouth, nose, or skin; headache; loss of appetite; loss of taste; nausea; nervousness), including being a powerful anti-cholinergic that suppresses the parasympathetic nervous system as well as death. 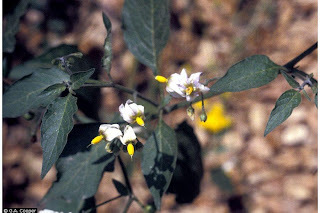 Treatment: Most common treatment of poisoning caused by Nightshade is forced vomiting, the use of activated charcoal to absorb the poison or stomach pump. Notes: When I chose this plant I didn't expect to find nothing beyond a description of it online or in a book. I spoke to two Chumash friends and they were unfamiliar with it which was strange considering it is a very common local plant. I finally ask a herbalist friend. Don't know how to site actual people from interviews.